The PCA welcomes artists to apply for consideration as an Artist of the Month. The following information will give you a good idea of what’s involved and your responsibilities throughout the process. How do I become an Artist of the Month? What are the basic steps of a PCA art show? How long will my art be up? How many pieces of art can I show? How do I publicize my show? How should I label my artwork? When will artwork be seen? Does the PCA carry insurance for the artwork? When are the PCA gallery hours? Who is responsible for monitoring the PCA during gallery hours? One month. Some exhibits are a bit longer to work around the PCA’s annual art event. The hanging day/time is scheduled with the PCA manager at a mutually convenient time for the artist, Gallery Contact and the PCA schedule. Most exhibits can be hung in 2-3 hours. We recommend a minimum of 20 – 25 pieces for a show. For larger work (over 36”), fewer pieces may be adequate. The PCA walls can accommodate several hundred pieces of work. View our Gallery Hanging Map to get an idea of the hanging space and how many pieces are possible. One idea is to do the math and plan out ahead of time how many pieces fit on each wall and basic plan of where to hang them. This can make hanging the show easier and faster. Artwork should be framed and have a hanging wire across the back. Saw-tooth hangers do not work well with the PCA’s hanging system. Canvas frames do not require frames as long as they have a hanging wire. There is no right or wrong way to hang your artwork. It is best to arrange the pieces against the wall (sitting on the floor) before hanging them. Pieces can be grouped by size, frame/mat color, theme (e.g. all florals together), etc. It is easiest to hang one piece per hanging wire but artwork can be stacked on the same wire. When hanging in art in the hallway located just off the small gallery space, it is best, if possible, to hang all pieces on one side so that patrons can back away from the work to view it. It is nice to hang strong pieces on either side of the small gallery entrance to entice visitor to enter the space. Most successful shows have a strong central theme tying all the pieces together. For example, one artist had painted all nautical and beach paintings. The pieces varied in size and shape but the subject tied them all together and created a cohesive look. Another artist hung a large number of paintings that were the exact same size canvas. The subjects varied but because, visually, the size identical, the show had a strong visual impact. Group exhibits can be harder to create a consistent look and feel but if you can find a common theme to tie the work together, it will be a stronger show. Less is sometimes more. Artists may want to use the show as an opportunity to hang many pieces of art they’ve created. Perhaps some were done early in their career before their skills were honed. A strong show has consistent quality and isn’t peppered with less skillful work which can bring down the overall quality of the show. Biography. Patrons are interested to learn about your background so you may want to frame your artist biography and/or statement and hang it. Publicity is the key to a good turn out. The basic rule of publicity is to start sharing details about your show anywhere from 4-6 weeks prior to your opening reception. Your biggest supporters will be your personal network so be sure to let family, friends co-workers and neighbors know and to save the date. Newspapers, on-line sites, Facebook, etc. are all ways to reach the public and get the word out. You may want to contact your local newspaper and ask if they’d be interested in running a story on you and your art just prior to your reception (papers are often looking for local news stories). Make sure to contact them in advance allowing ample time for them work send out a reporter, take photos and write the story. Some people will read about your show in the newspaper, some via Facebook, some via the Patch, etc. so covering as many outlets as possible is best. You may want to create a postcard to announce your show. For a minimal fee, the PCA will share mailing labels with a list of PCA members (approximately 200 names/addresses). We recommend sending postcards well in advance to personal contacts (so they can save the date) and perhaps send remaining postcards to PCA members 1-2 weeks in advance so it is fresher. You can also place postcards in local businesses (e.g. a frame shop) where the public may want to view your show. The PCA recommends printing your labels and attaching them directly to the artwork. The label can be printed on regular copy paper or card stock. It is best to hang your work and then attach the labels after so they don’t get wrinkled in transport and during the hanging. From the front, the label hangs beneath the frame. 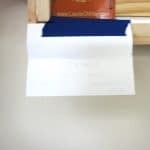 The label is attached to the back using a piece of blue painters tape or other low residue tape. You could also attach the label to the side at either the lower left or right corner. Some white space should be left at the top of the label so that it has room to hang beneath the frame as shown in the examples above. These labels are about 3 inches wide. You can also purchase clear labels that can be attached directly to the wall. However, we’ve had cases where these labels tend to curl up and fall off. White, paper sticky labels are not allowed as they don’t remove cleanly from the wall and may cause damage. Even though the PCA only has 2 dedicated gallery hours each week (Sundays from noon – 2 p.m.) the artwork is seen whenever an event is held. The PCA is generally quite busy with concerts, theatre events, comedy nights, karaoke events, classes, recitals as well as private rentals. The PCA does not carry insurance for your artwork. Your homeowner policy may already cover your art or you can add a specific rider for the duration of your show. We’ve had 2 incidents related to art damage since 2000. In one case, an acrylic painting had a few splatters of food. Fortunately, the artist was able to clean and then cover the damage. In a second incident, a renter decided to remove a hanging sculpture and damaged it in the process. The renter paid the artist for the piece. It should be noted that all renters sign a contract with the PCA and are instructed that they are not to touch or move the artwork. The PCA does not have an on-site manager or maintenance person. A core set of volunteers can access to the building at any time to run events and classes. The PCA is only unlocked when a volunteer or renter is inside. It is never intentionally left unlocked. By default, the PCA reserved the first Sunday afternoon of the month for your reception. If there is availability, you can choose to host your reception during a different day or time. Day time receptions tend to be less formal and more friendly to kids and seniors. For winter months, a day time reception may be more desirable. Most are 2 -3 hours long and start at noon, 1 or 2 p.m. Expectations for an evening receptions are generally more formal with an adult/cocktail party atmosphere. The artist is responsible for hosting their opening reception which means providing food, drink, serving utensils, platters, napkins, cups and tablecloths. A guest book, flowers, and portable music are all additional touches that make the event special. Most people set up 5 or 6 round café tables for guests to sit and enjoy refreshments. 4 chairs sit comfortably around these tables. The café tables have artistically painted tops so tablecloths are not necessary (unless you want a more formal, unified look). The remaining tables are 6 foot folding banquet tables which typically are used for serving food and drinks. Food: Most artists keep the reception simple with cheese, crackers, grapes or cut fruit, and desserts like cookies or brownies. Finger foods and individual servings are easiest as they don’t require utensils or plates. Most artists provide wine, soda and/or water. The artist is responsible for setting up the PCA for their reception (tables, chairs, etc) as well as cleaning up afterwards. Folding up the tables, stacking chairs, bringing trash and recycles to the receptacles in the basement, cleaning up the kitchen, sweeping the floors, etc. The PCA does not have a maintenance crew so we rely on the kindness of everyone to clean up after themselves and leave the building in good shape for the next person. Pricing artwork is a very personal decision and many factors must be taken into consideration: size, framing costs, artist experience/reputation, etc. At the PCA, most art sells in the $75 – $300 range. A few artists have sold pieces for $1000+ but that is the exception. If you normally sell work at a higher price point, you might consider showing smaller, more affordable pieces. The artist is responsible for collecting money from the buyer and making arrangements for getting the art to the buyer. Most artists ask buyers to meet at the PCA during their final gallery hours to pick up their purchase. If not, the artist figure out how to deliver the art. When a buyer wants a piece of art, place a red dot sticker on the display label to indicate that it has sold. Stickers are usually available in the desk that sits in the gallery. The majority of art sells during the reception. It is advisable to ask a friend or partner to help with sales during your reception. You may want to create a “Sales Form” to track sales and include: Buyer Name, Buyer Phone number, Buyer email, Title of Work, Price, and Payment. Creating a spreadsheet with all the artwork pre-printed is a great way to track sales. 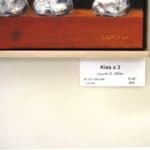 The report would include basic information about each piece of art (title, price, size, etc) and then blank spaces to fill in the buyer’s contact info and payment status. On occasion, a visitor will call the PCA to let us know that they want to purchase a piece of art. The PCA Manager will contact the artist to let them know and connect them with the buyer. We discourage artists from allowing buyers to take their purchases prior to the end of the show but in cases where it is logistically difficult, it is up to the artist to determine how to handle it. After the show is over and the artist has collected all the money, they should make a check, payable to “PCA” for 20% of all sales (this includes art, prints, greeting cards, etc). Check should be sent to: PCA, PO Box 411, Westford, MA 01886. Because the artist is responsible for collecting the money, it is entirely up to you to determine which forms of payment you will accept. Is it easy to accept cash and personal checks. For credit cards, Square is very popular and is easily set up with a smart phone. Since most people don’t carry cash and checks, you might get extra sales if you make it easy for your buyer by accepting credit cards. The PCA reserves Sundays from noon – 2 p.m. for gallery hours. During this time, no events are held on the first floor of the building. The artist is responsible for staffing the building during gallery hours. If the artist is unable to be there, they can ask a friend, or, a volunteer from the PCA may be available. If no one is available, then building is locked and closed. During your building orientation, a gallery contact shows the artist how to open the building, turn on the lights, turn up the heat, and put out the “gallery open” sign. At 2 p.m., the artist closes and locks the building. The artist. If you are not available for one of your Sunday gallery hours, the PCA may be able to provide a volunteer, however, if not, then the gallery will be closed for that afternoon. Consider creating Greeting Cards and/or prints. Not everyone can afford spending $100+ on an original piece of art but may love your work and want to support you. So, you might consider selling greeting cards and/or prints as another means to generate sales. FYI, these items cannot be left in the building when you aren’t there but can be sold during your reception and Sunday gallery hours. Please note that the 20% commission applies to all sales at the PCA. Consider giving a demonstration or artists’ talk. You can always host it during your Sunday gallery hours noon – 2 p.m., or, alternatively during a weekday evening as long as the PCA schedule permits. Every artist is assigned a gallery contact to help them with their show. All gallery contacts have hosted shows at the PCA and are a good resource for questions. If they don’t know the answer, they can find someone who does! give you a building orientation – lock/unlock the building, light switches, trash, etc. * Schedule permitting. If the contact is not available during these scheduled times, they will meet you in advance to orient you to the building. The PCA manager controls the calendar and can let you know when you can access the building. Call 978-692-6333 or email pca@westford.org if you want to access the building at times other than your hanging, reception, gallery or take down hours.